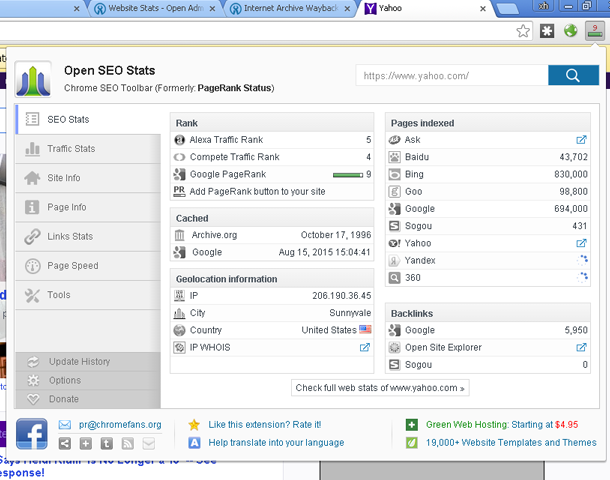 The top SEO extension - Open SEO Stats(Formerly: PageRank Status) has been updated to version 9.0! Add a search box in the top section of the extension. 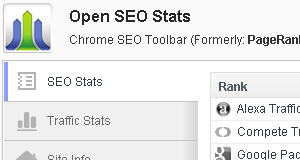 You can directly enter the site URL to check the website stats now. Provide web-based SEO report at OpenAdminTools.com. Fix a bug that Page Speed module is not working on Google Chrome 44 and causing error message "Uncaught TypeError: Illegal invocation - extensions::SafeBuiltins:82" in console window. OpenAdminTools.com is a new site for webmasters and developers. Currently, you can track Google PageRank, Traffic Stats, Pages Indexed, Cache History, Backlinks, SNS Stats, Server Analysis and more SEO elements online by one clicking. I will develop more online webmaster tools in future. Do you have any suggestions or advices? Please leave your feedback in comments or send email to andrew@chromefans.org. This is a great tool! I really like how you did it and it provides a great benefit for everyone interested.